With the implementation of the TOPGUN program at Miramar, the Navy Fighter Weapons School decided to add a new aircraft in the aggressor role, originally assigned only to the F-5E’s of VFC-13. 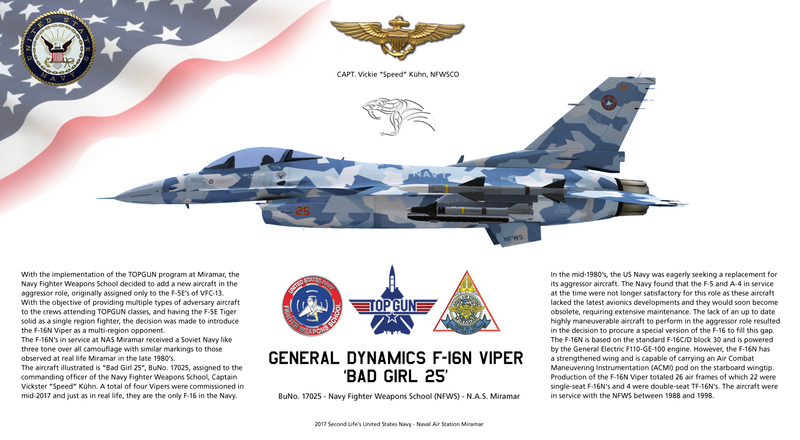 With the objective of providing multiple types of adversary aircraft to the crews attending TOPGUN classes, and having the F-5E Tiger solid as a single region fighter, the decision was made to introduce the General Dynamics F-16N Viper as a multi-region opponent for DACT purposes. The F-16N’s in service at NAS Miramar received a Soviet Navy like three tone over all camouflage with similar markings to those observed at real life Miramar in the late 1980’s. The aircraft illustrated is “Bad Girl 25”, BuNo. 17025, assigned to the commanding officer of the Navy Fighter Weapons School, Captain Vickster “Speed” Kühn. A total of four Vipers were commissioned in mid-2017 and just as in real life, they are the only F-16 in the Navy. In the mid-1980’s, the US Navy was eagerly seeking a replacement for its aggressor aircraft. The Navy found that the F-5 and A-4 in service at the time were not longer satisfactory for this role as these aircraft lacked the latest avionics developments and they would soon become obsolete, requiring extensive maintenance. The lack of an up to date highly maneuverable aircraft to perform in the aggressor role with DACT characteristics resulted in the decision to procure a special version of the F-16 to fill this gap. The F-16N is based on the standard F-16C/D block 30 and is powered by the General Electric F110-GE-100 engine. However, the F-16N has a strengthened wing and is capable of carrying an Air Combat Maneuvering Instrumentation (ACMI) pod on the starboard wingtip. Production of the F-16N Viper totaled 26 air frames of which 22 were single-seat F-16N's and 4 were double-seat TF-16N's. The aircraft were in service with the NFWS between 1988 and 1998. 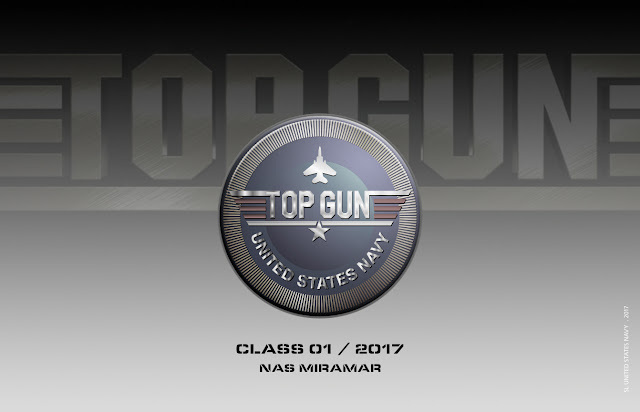 Induction for class 01 of 2017 of TOPGUN is Saturday, August 5, 12:00 hours. Crews will gather at NAS Miramar briefing room for the initial over view and planning. The objective of TOPGUN in Second Life is to develop Dissimilar Air Combat Tactics (DACT) in this environment. More often than not, ACM in Second Life (SLACM) takes place between very different aircraft types. Developing DACT skills is the key to successfully engage in SLACM. So the need exists and the need is here. For the four weeks after August 5, the crews will experience multiple scenarios for which they need to adapt and apply the theory discussed in the classes, culminating in a series of encounters that will determine who best can apply the knowledge to air combat. Refer to our NFWS TOPGUN page for details (see here).